Sumitomo Electric Industries, Ltd. has become the first company to receive Thunderbolt certification from Intel Corporation for the optical Thunderbolt cable and has started the mass production. Based on Intel’s Thunderbolt technology, this new optical Thunderbolt cable enables long-distance data transmission. 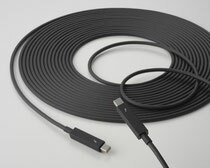 Sumitomo Electric developed this cable through its expertise in optical fiber and module development and, in April 2012, began shipment of the sample products. All Thunderbolt products must undergo a certification process to ensure optimal operation and end-user experience. The officially certified products provide highly reliable data transmission at a high speed of 10Gbps. The optical Thunderbolt cable is an active optical cable that enables long-distance transmission up to 30 meters to connect Thunderbolt devices together. The optical Thunderbolt cable is the same diameter as the conventional metal Thunderbolt cable (4.2 mm), and handles just as easily. Sumitomo Electric’s special optical fiber makes the cable robust and durable for everyday use. This optical fiber offers high bending performance even when pinched up to 180 degrees or tangled in knots.